Those of you who have access to Maggie Glezer’s excellent book, Artisan Baking Across America, where I got the recipe, will realize right away that this isn’t the way the bread is supposed to look. I love their presentation too and I’ll probably make the Sweet Perrin that way one day, especially around the holidays when it would make a lovely present to bring to someone’s house. But for this once, I wanted to give the bread a pear shape. 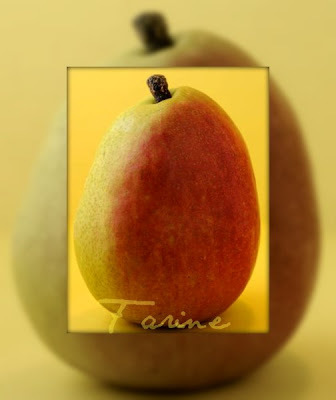 Except for the shaping and the use of pureed canned pears in lieu of a jar of pear baby food (which would have required a trip to the supermarket), I pretty much followed the recipe as indicated. When I make it again though, I may skip the cinnamon as we are not huge fans of that particular spice (maybe because the taste of cinnamon as we know it in the United States is more assertive than the one we grew up with in Europe). Save this restriction, the bread is truly lovely. 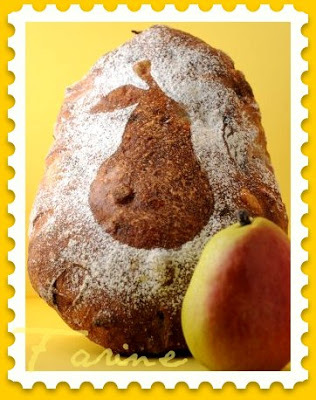 The raw pear bakes inside the bread and when you bite into it, it yields an explosion of sweet and fragrant juice in your mouth. The hazelnuts add a welcome crunch. The figs contribute a marvelous depth of flavor. 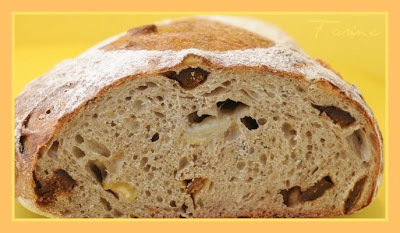 The cracked rye gives the crumb a chewy texture and the white whole wheat and high-extraction flour make it tastier and more wholesome. A good bread for the Man to bring to the office as a snack, which is why I made it! Method: (Glezer gives instructions for 3 different mixing methods, by hand, by stand mixer and by food processor. I used a mixer with a dough hook). This bread is made over 2 days. The Sweet Perrin goes to Susan, from Wild Yeast, for Yeastpotting . Glezer's book is a favorite of mine and this bread has been on my list for a while. I love it as shown in the book but yours is stunning also! When I was at the food blogger's conference in Seattle we were lucky to have a breakfast catered by Essential Baking with a huge variety of breads and pastries. I don't think this one was among them, but everything I tried was wonderful. Thanks, Susan! From the book I have also baked Essential Columbia and loved it. You are lucky to have been able to sample their product line… For me, it'd be reason enough to plan another trip to Seattle, even if I didn't already love the city, Puget Sound islands and the Cascade mountains! This bread sounds and looks delicious indeed! 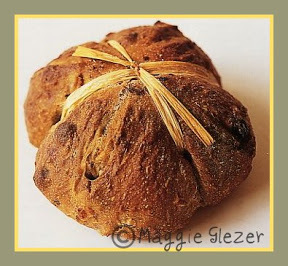 Has baked Fig and Fennel bread rye sourbough and enjoyed it….and now A NEW TEMTETIONS FOR ME!!!!! Looks fantastic. For a second I thought this was the recipe from SFBI. There's also a pear stencil on it. I drive my husband crazy with my demands for visits to Essentials when we're visiting our son in Seattle. I love their breads. 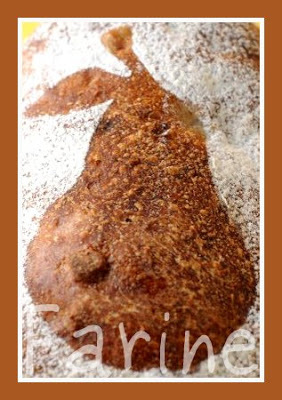 Very beautiful pear bread Farine. 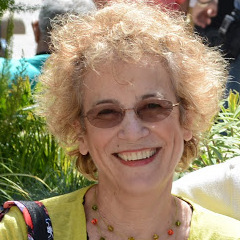 Thanks, Miriam! It's a really good bread to keep in mind for the fall. Alla, your passion for bread and enthusiasm are very contagious! Jude, thanks. Don't they say that imitation is the sincerest form of flattery? I liked the SFBI shaping and stencil so much that I couldn't resist borrowing the looks of their bread. Thank you, HalfCups. It's wonderful to have a child in an interesting city, right? One of mine lives near San Francisco and I love it. Re: bread books. Yes, it is too bad we can't bake each and every recipe, isn't it? A beautiful rendition! So, they do use fruit purees in breads! (I've just commented on your Double Apple Bread that I might try adding apple puree when I make it and saw your pear bread.) What a lovely creation. Reading your post is such a visual delight. Thank you. Beautiful! I've been eyeing this recipe in Glezer's book for a while now. I'll have to try it soon. Bread with pears and figs – sounds divine! As soon as I find good pears at my farmer's market, this will be made! Absolutely beautiful. I want to reach in and take a bite! How beautiful this is. The crumb look absolutely gorgeous. The real cinnamon you remember (canela) can be easily found in a Mexican grocery – unfortunately, you cannot believe the label because all US cinnamon distributors know that canela is considered "real", while cassia (the stuff sold in America) is not – so everybody calls their cinnamon "canela" today. Actually, I like them both, so I keep both on hand – depending on what you're cooking, they both have their place – I think cinnamon rolls need the aggressive cassia punch, while a mole sauce needs the subtlety of real canela. BTW, thanks for posting this recipe…I live where I can buy the original in season, but hunger for it when it's not available…now there's a fix for that! Just made this tonight. I used the full amount of water in the recipe plus a juicy pear, which was way too much water overall. The dough was as wet as a ciabatta, and so the loaf ended up looking rather like an artisan pancake. Nevertheless, it was delicious and I will make it again, just with a little less water. I only used 1 tsp. of salt since it seemed like a lot of salt in the recipe, but the loaf could have used a little more, I'll bump that back up next time. Thanks so much for the recipe, I love that Essential Baking loaf and have wanted to give making it a try for a long time.